Acadian Redi-Mix has been delivering top quality concrete products to the Acadiana region safely and efficiently since we were founded in 2006. As a locally owned and operated company, Acadian Redi-Mix focuses 100% of our energy in the Acadiana region to make sure that you get the attention and service you deserve when choosing your concrete needs. We were founded with the philosophy of delivering the best product available with a strong focus on premiere customer service and safety in all of our operations. We offer an extensive product list and are confident that we can help with any of your concrete needs. From patios to industrial jobs, we have experience in all areas. We invite you to call for your free estimate today on all your concrete needs at competitive prices with great service. 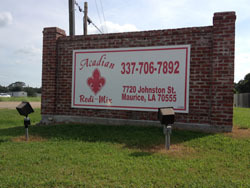 Click here to contact Acadian Redi Mix.